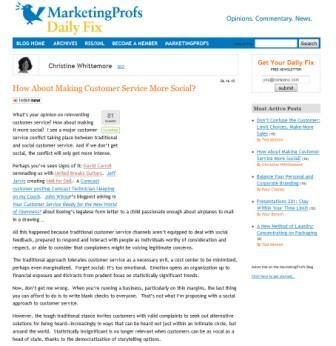 If you haven't yet had a chance, you might check out 'How About Making Customer Service More Social? ', my latest post on MarketingProfs Daily Fix. The discussion in the comments section has been robust. Perhaps you'd like to add to it? "Humility, respect for customers, a willingness to appreciate individuals within corporate walls as well as outside, a desire to improve and truly delight, proper training, openness to a variety of perspectives, a willingness to empower and be human and a strong desire to listen. All characteristics of a social customer-service company. Customer service is an important part of any business. It is not just a department in some businesses but is part of what every employee should have on their mind whether they answer the phone, sell parts, service equipment, etc. Consider the receptionist, generally the first point of contact when a customer calls your business. If a receptionist can answer calls on the first ring and get the caller to the right person on the first try, how might that improve your customer’s impression of YOUR business? They may even decide to purchase that new product advertised in the postcard printing ad they received! brochure printing, I love how you characterize customer service. It shouldn't be siloed, but rather integrated completely into everyone's responsibilities. The person calling shouldn't have to jump through hoops to do business.